Support our Podcast and choose the topics we cover in 2018! We are Nick and Katie. Nick is a sociologist, Katie is a social justice lawyer and we are both activists. For over 6 years we have hosted Progressive Podcast Australia, a podcast that gives a voice to Left, progressive and anarchist voices and ideas that are neglected in the mainstream media. We are asking donations to help improve the sound quality of our show and those supporting the campaign will also be given the opportunity to choose the topics we cover on the show in 2018! We believe our podcast provides an important platform for activists to get their message out beyond the mainstream media, who generally only give activists a few seconds to get their message out, in the rare times they are given a voice at all. We want to keep giving a voice to progressive activists and ideas. However, to produce the podcast at the high quality level us and our listeners expect, it costs money. You can help keep our podcast going strong by donating any amount before this campaign closes on the 23rd of February. We are looking to raise some money to buy a second microphone stand and a new microphone, due to our old microphone breaking. This new equipment will help to maintain and improve the standard of the podcast. If we get to at least $100 we will buy a new microphone stand and if we reach our full target of $200 then we will buy a new stand as well as a new microphone, which will ensure optimal sound quality. Any additional money raised will be put towards the hosting fees for the podcast – a monthly fee we pay so our podcast can be available through applications such as iTunes and Stitcher. *Update: We've just passed the half way point of $100 so we'll order a new mic stand - we're looking forward to retiring our existing "mic stand" of board games! Thanks to those who have already donated and we appreciate any further support to get us to our full goal! There are also other perks for donating to the show, including getting a shout out on the show plus Progressive Podcast Australia badges and iron-on patches. Thanks so much for your support and we look forward to bringing you episodes on topics of your choice in 2018! An episode dedicated to you and a shout out on the show. You can also have a message read out on the show saying pretty much whatever you want – this can include promoting something you’re doing, giving a shout out to an organisation or campaign you support etc. An episode of your choice will air some time in 2018. Choose one topic from the list here: https://progressivepodcastaustralia.com/membership/ With this perk you will also get an episode dedicated to you and a shout out on the show some time in 2018. You can also have a message read out on the show saying pretty much whatever you want – this can include promoting something you’re doing, giving a shout out to an organisation or campaign you support etc. 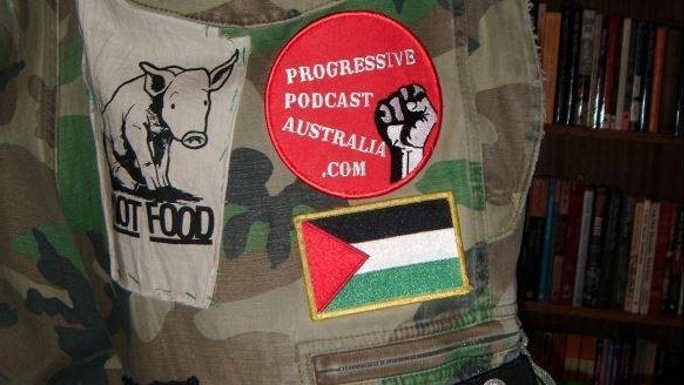 1 Progressive Podcast Australia badge with PPA logo. An episode of your choice will air some time in 2018. Choose one topic from the list here: https://progressivepodcastaustralia.com/membership/ An episode dedicated to you and a shout out on the show some time in 2018. You can also have a message read out on the show saying pretty much whatever you want – this can include promoting something you’re doing, giving a shout out to an organisation or campaign you support etc. 1 Progressive Podcast Australia iron-on patch with PPA logo. An episode of your choice will air some time in 2018. Choose one topic from the list here: https://progressivepodcastaustralia.com/membership/ An episode dedicated to you and a shout out on the show some time in 2018. You can also have a message read out on the show saying pretty much whatever you want – this can include promoting something you’re doing, giving a shout out to an organisation or campaign you support etc. 1 Progressive Podcast Australia iron-on patch with PPA logo. 1 Progressive Podcast Australia badge with PPA logo. An episode of your choice will air some time in 2018. Choose one topic from the list here: https://progressivepodcastaustralia.com/membership/ An episode dedicated to you and a shout out on the show some time in 2018. You can also have a message read out on the show saying pretty much whatever you want – this can include promoting something you’re doing, giving a shout out to an organisation or campaign you support etc. Get in touch with Support our Podcast and choose the topics we cover in 2018!